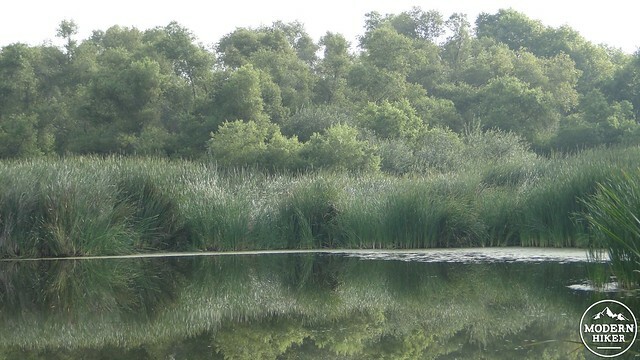 This choose-your-own adventure hike through the north section of Mission Trails Regional Park visits a rare patch of native grasslands, a dam constructed by Spanish missionaries, a short but sharp peak ascent, and a lake occupying what was once a military base. Any one of these destinations can make a satisfying hike on its own, but taken together they form a varied and satisfying walkabout. This write-up will give you directions to do all of the above or to cobble together whatever kind of adventure suits your mood. 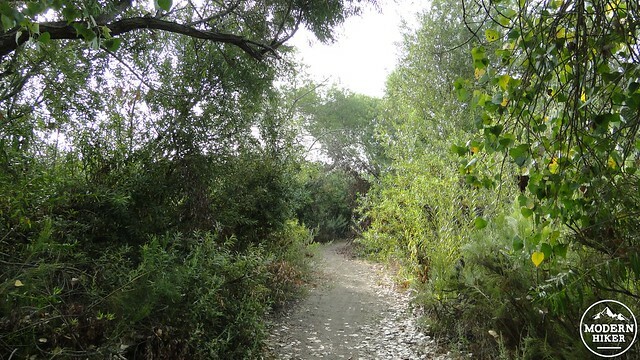 The Mission Trails area has always been a magnet for people due to the presence of the San Diego River, grasslands, wildlife, and other sources of food such as acorns from oak trees. The history for the area is correspondingly rich and goes far beyond the scope of this article. For those interested, a thorough overview of the area’s history can be explored on the Mission Trails Regional Park site. Relevant to this article is the Mission Dam, which was constructed by Spanish Missionaries to control the flow of the river for reservoir and agricultural purposes. The dam still stands, and when there has been enough precipitation, the dam contains a small lake. 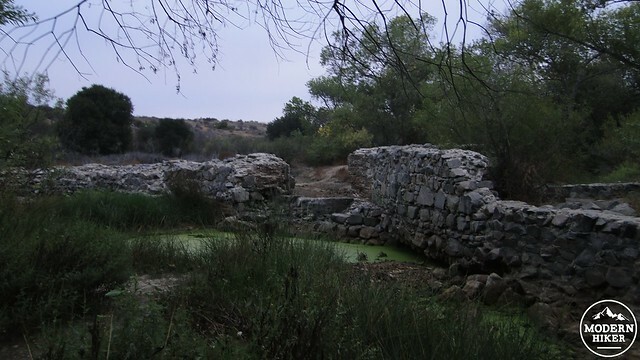 Nearby Kumeyaay Lake was once part of the Marine Corp’s Camp Ellliot, which used the surrounding land as a training ground. 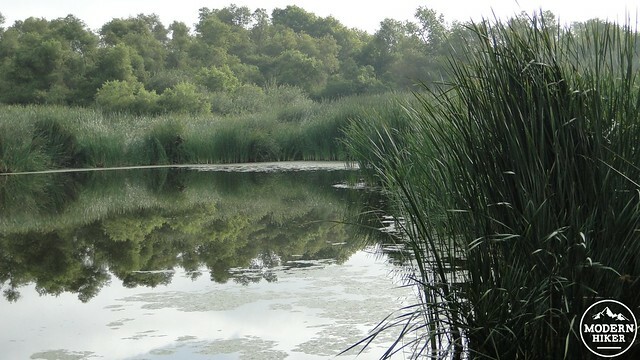 After the military deeded the land back to the city, the area around the lake underwent extensive restoration to remove unexploded munitions and to reforest the riparian vegetation surrounding the lakes and the river. An interpretive display at the trailhead to the river testifies to the success of the restoration. The area was once barren and completely deforested. Now, the area is alive with willows, cottonwoods, oaks, and sycamores. 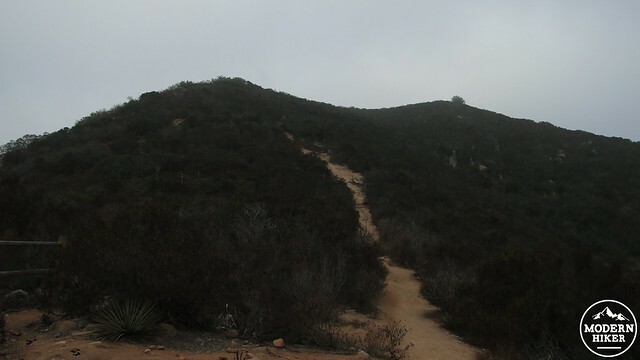 This hike begins at a large parking lot directly opposite of the Mission Trails Campground. As this is a choose-your-own adventure hike, you can use this spot as a jumping off spot for all three portions of the hike. 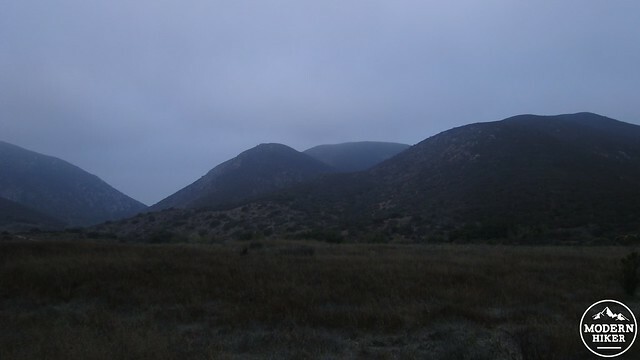 The Kumeyaay Lake section ranges from .6 to 1.6 mile as an out-and-back part of the way around the lake. Kwaay Paay Peak is a 2.2 mile out-and-back that also contains the bulk of the elevation gain. The Mission Dam loop is a 2.75 mile loop, although this figure should a little longer since I got a wild hair and shortcutted the dam instead of the bridge downstream, which is impossible to do if there’s a lot of water around. Bad, bad, bad hiking writer. To start, leave the parking lot and turn left to walk .25 mile along Junipero Serra Road before taking a right onto the Grasslands Crossing Trail. You will drop down to cross a concrete ford over the San Diego River. After passing under the shade of the willows and cottonwoods, you’ll emerge on a wide plain covered in native grasses. Continue straight another .25 mile before taking a left onto the Grasslands Diagonal Trail. This trail will take you up and over a low rise on the plain. 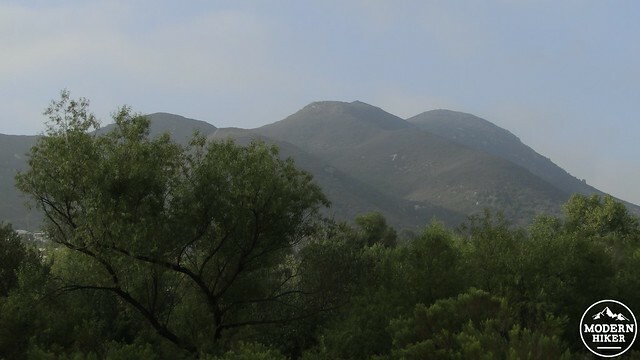 Looking right, you will notice the 5 main peaks of the Mission Trails area, including Cowles Mountain, Pyles Peak, North Fortuna, South Fortuna, and Kwaay Paay Peak. Closer afoot, this plain will be covered with lush, green grasses and wildflowers during the spring season (although not so much in summer). The Diagonal Trail will junction with a continuation of the Grasslands Loop Trail, which after a left turn will quickly junction with the Oak Canyon Trail veering off on the right. 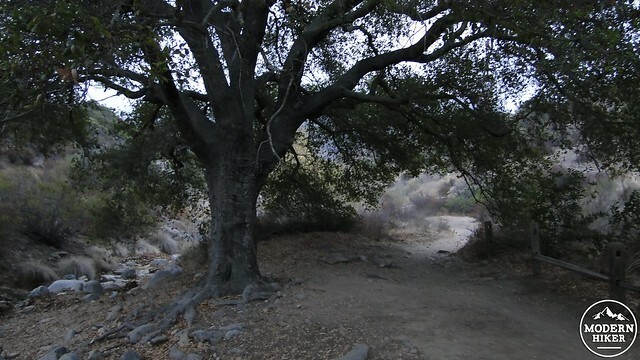 Take the Oak Canyon Trail to drop down along a seasonal creek studded with oaks and sycamores. This pleasant ravine drains into the San Diego River, which means that the trail will lead you to the river at the location of the dam. Another junction occurs with a side trail leading left to go closer to the creek while another trail sticks to the right. If the water is low or non-existent, you can keep left to follow the use trail I followed in the GPS track, which will cross the dam. Even though I crossed the dam, I can’t say I recommend it. Truth be told, I got halfway across, realized I had committed myself, and had to do a quick bit of scrambling to get to the other side. If this doesn’t sound like fun to you or if the water is high, keep to the right instead and follow the trail until it comes to a left turn leading to a bridge across the river. I get the wild hairs so that you don’t have to. Once you get close to the dam, you will get a chance to enjoy the small lake (or absence of it during drought years). This is a popular stopping spot, and it features picnic tables and a wealth of informative displays describing Native life, Spanish life, and the process through which the San Diego River carved out the gorge between Kwaay Paay and South Fortuna Mountain. Walk up the access trail back to the road and look directly across the street to find the western branch of the Kwaay Paay Peak Trail. Another branch lies just to the east, and this will be your return route. Just beyond the landing pad, you will reach the flat summit. My pictures don’t show it as I took them on a day with a pretty strong marine layer. If the air is clear, you will enjoy views over the San Diego skyline/bay area, as well as everything west of the 15. 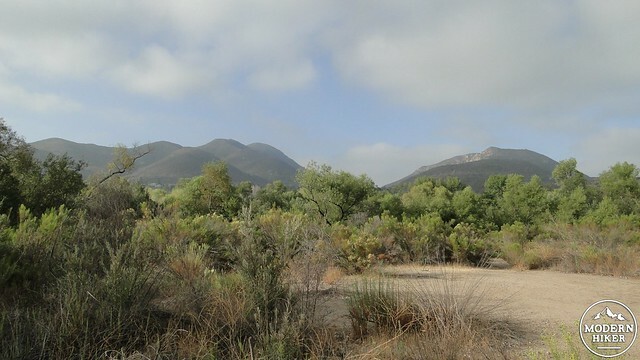 Looking east, you will see the rugged backcountry, including El Cajon Mountain, Cuyamaca Peak, and the flat plateau of the Laguna Mountains. Once you’ve enjoyed the view, you will return the way you came until you reach the junction. 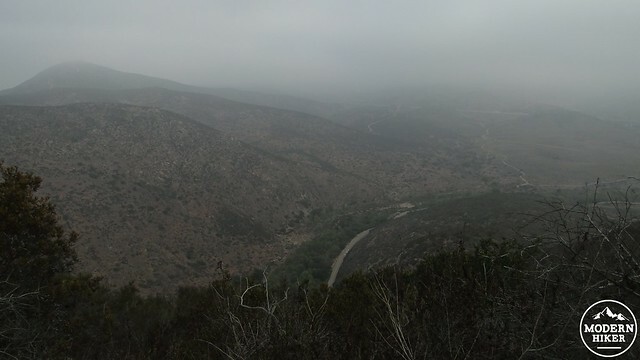 However, instead of veering left to return to the dam, keep to the right and return to Junipero Serra Road. Once at Junipero Serra Road. you have the option of turning left and walking back to the parking lot. If you feel like you’ve got a little more hiking left in you, or if you’re only interested in a leisurely stroll around the lake, walk about 100 yards to the right and find a connector trail leading to the campground and then to the lake. 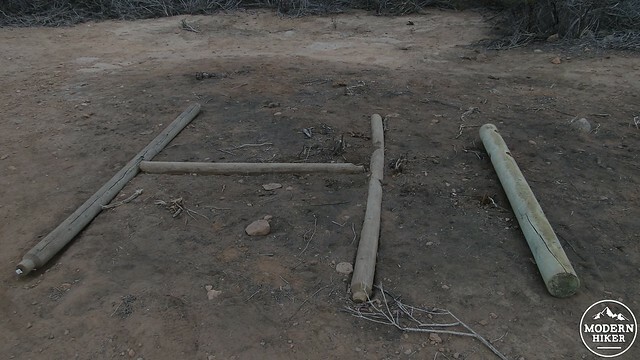 You’ll see a sign indicating the possibility of unexploded ordinance that the park never found. It’s unlikely you’ll stumble upon a bomb, but it’s best to stick to the trail anyway. This connector will lead to the campground. Step onto the campground loop road and turn left to follow until you come to the scenic trail just opposite the bathroom. Turn left. The trail will plunge into riparian wilderness along the south bank of the lake. 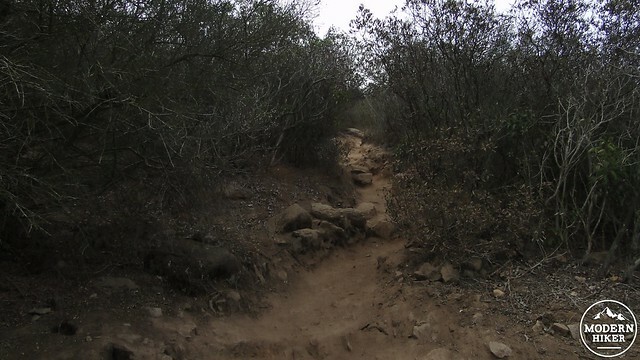 Continue going left past the amphitheater and follow as the wide track becomes narrower and narrower until becoming a single track trail through incredibly dense vegetation. You’ll catch glimpses of the lake here on either side. 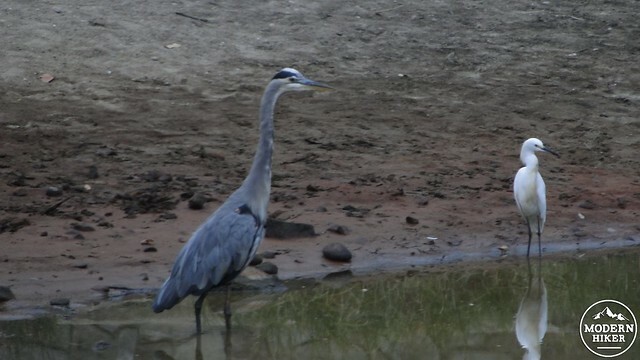 You’ll also likely see a number of birds in the area, and the lake is a favorite spot for birdwatching enthusiasts. Follow the trail until it dead-ends at a swamp where you will turn around and make your way back. After the dry plains and rugged, rocky peak, you’ll wish for a lot more of this lakeside trail, but sadly it does not continue any further. Thankfully, benches are placed at intervals to allow you to stop and rest to soak in the scene. When you’re done, return back to the campground and pass through it back to Junipero Serra Road. The parking lot will be directly across the road. – This trip is best in the cooler winter and spring months, but it can be done successfully and without too much discomfort on an early summer morning, especially with the marine layer present. This will obscure the views somewhat, but it will keep you cool. The trail is well-maintained and easy to follow, except at a few very steep spots on Kwaay Paay. Having trekking poles would help on Kwaay Paay to keep balance and provide a little bit of extra oomph to get up the hill. The Kumeyaay Lake Campground is directly across the street from the parking lot. You will have to walk through it to get to the lake.